Product information "BONFIRE - Temple Of Lies - Ltd. Gtf. Red Vinyl"
It’s not only the occasionally tougher pace that impresses on Temple Of Lies (produced by Hans Ziller at the Flatliners Recording Studios in Ingolstadt) from the first to the very last note, but also the album’s diverse high-quality songwriting in general. Driving midtempo tracks (‘Feed The Fire’, ‘On The Wings Of An Angel’, ‘Fly Away’, ‘Crazy Over You’) support the afore-mentioned uptempo rock numbers and are expertly broken up by the ballad ‘Comin` Home’ and ‘Love The Way You Hate Me’, which surprises with a reggae groove verse. Temple Of Lies kicks off with the intro ‘In The Beginning’, featuring American voice actor David Michael Williamson. So the fun factor is back in the Bonfire camp, manifesting itself also in the 20-minute bonus track ‘Friedensreich II. – The Return Of The Zünsler Into The T.O.L.’, a humorous sound collage which frequently brings to mind Frank Zappa. The programmatic album title and expressive cover artwork prove that Ziller & Co also live up to their responsibility as socially aware musicians, taking to task “the lies of our world and politicians”. 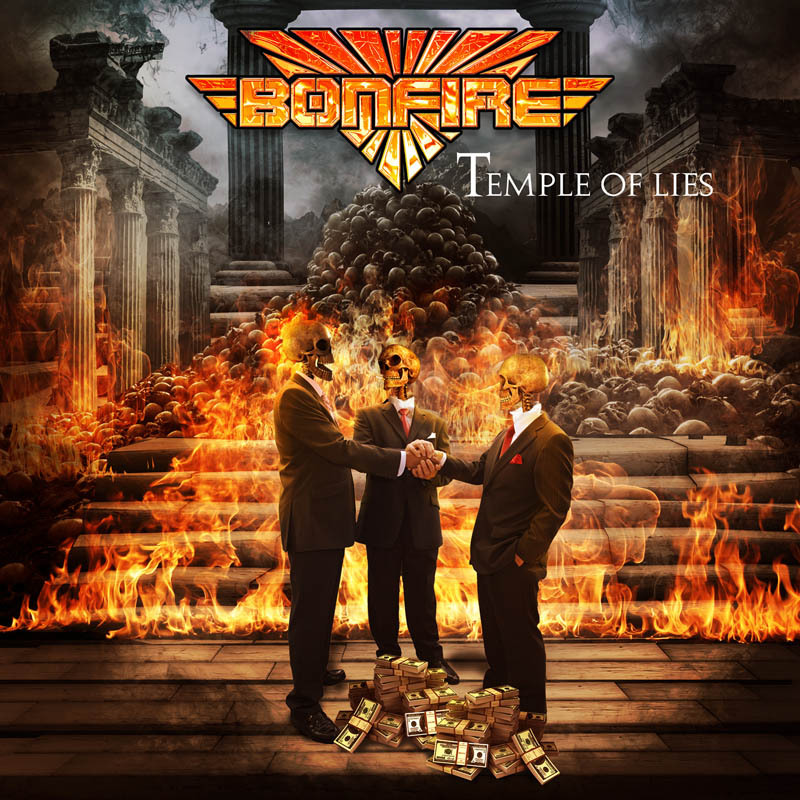 No doubt about it: Temple Of Lies sees Bonfire live up not only to their own history. Related links to "BONFIRE - Temple Of Lies - Ltd. Gtf. 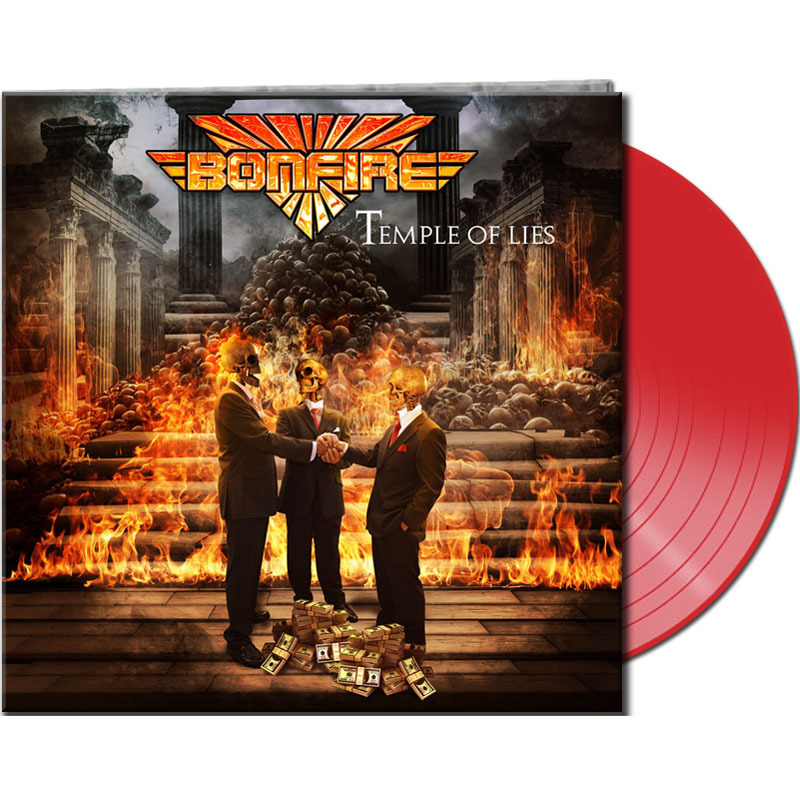 Red Vinyl"
Customer evaluation for "BONFIRE - Temple Of Lies - Ltd. Gtf. Red Vinyl"